Spyro: Reignited Trilogy is now out available on PlayStation 4 and Xbox One and there's still no official word about a Switch release. Even after multiple listings - including Nintendo's digital storefront - there's been no announcement. So, what exactly is going on? Not much, apparently. The Toys For Bob producer Peter Kavic appeared on the Game Informer Show in November alongside art director Josh Nadelberg to discuss the recently released trilogy collection. Of course, during this segment, the pair was asked about the likelihood of the game appearing on other platforms. In response, Kavic said the attention was currently on the PlayStation 4 and Xbox One versions and the rest of the decision-making was up to the publisher Activision. 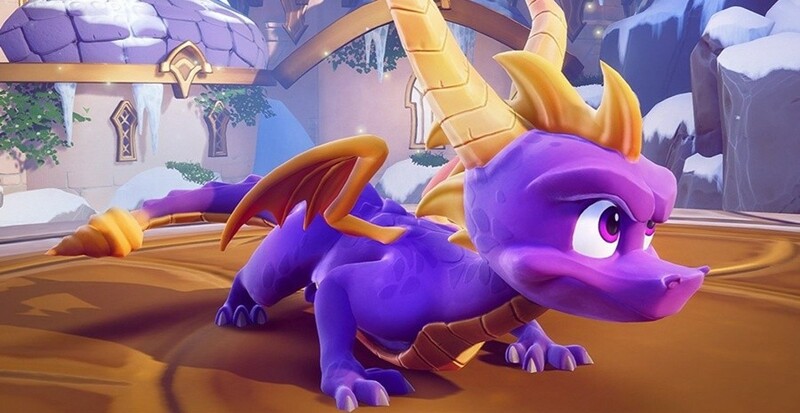 When questioned if the Switch could handle the latest Spyro release, the producer said he hadn't even seen it attempted but thought there might be a chance. If what Kavic is saying is true, it essentially means the development of the game on this specific platform was never underway in the first place, which would make sense considering there were no official announcements on Activision's end. The statement provided to us by Activision in November also confirmed the company - at the time - had no plans to announce the game on other platforms. What do you think? Would you like to see the Spyro: Reignited Trilogy eventually released on the Switch? Tell us below. I think this game would be pretty successful on Switch. Hopefully they can make it happen. Crash Bandicoot sold well enough so Activision has to know there's demand for it. I'm pretty sure Nintendo told them (Activision) to shut it until the next Nintendo Direct. Why else would Activision be too scare to announce anything about the game? It'll make the Switch, just not this year. The same goes for PC players who are still waiting for this game. I can see this selling like hot cakes on Switch so you’d think they’d at least try... seems pretty stupid not to. After the success of Crash, they’ve got to see the benefit of launching this on the Switch. I reckon they will go for a Q2 release. I swear half my game library consists of ports now, and I don’t think that will stop soon with SquareEnix shipping out several more in 2019. Another case of developers not possessing even the slightest clue of who butters their bread. It’s a baffling phenomenon to behold. Considering it took a random member of their team just testing it on his own time to greenlight the Crash port, I wonder if that'll be the case now. @Nanaki Crash in Smash would be an absolute dream come true for me, even if it is a long shot. From what I've seen, the original Spyro trilogy on PS1 sold pretty abysmally in Japan, so I don't know if Nintendo and Sakurai would have much of an interest. I would still love it though, but not as much as Crash. Again this bs, after Crash bandicoot that should be ready to release this on the Switch. It seems to me that it can run. Sigh... another article out of nothing. I don't know, the game is like 64 gigas on PS4. People don’t seem to think about that and imagine the complaining if it was announced and then when they realize it would be a 50+gb download. I think it's more of a matter of optimizing the game to run on the Switch's weaker specs. They've gotta figure out how to get the game to run on a system with half as much RAM as the PS4 and Xbox One. Unfortunate, but Nintendo's already going to have a killer 2019. This game's absence on the platform doesn't do it any good, but it's hardly necessary. 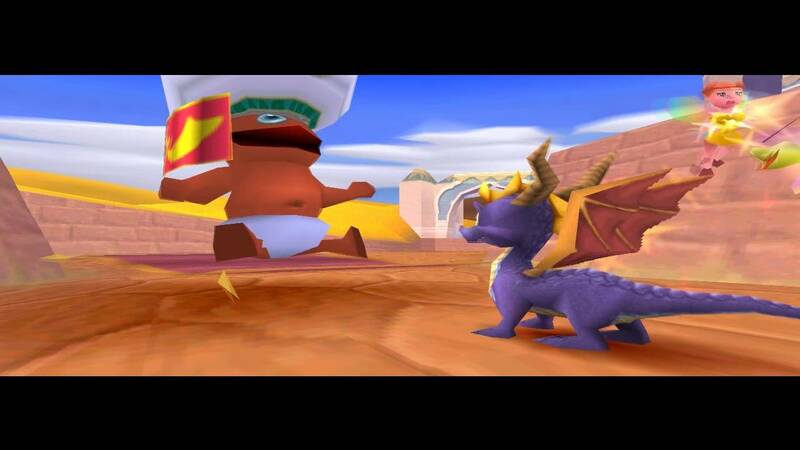 To me, Spyro's home is on the PS platform, anyway (which is where I'll be playing it ). I mean, why wouldn't it? I REALLY want to see this on Switch...I loved the Spyro games all those years ago, and have never gotten the chance to play them since. Plus, they look incredible with this remaster. If you're listening, Activision, I would absolutely buy this on Switch. Please. If the trilogy is at least at the same port quality as Crash Bandicoot NSane Trilogy, then bring it on! I've played it plenty on ps4 and they still havent got it right on there yet. Glitches galore. So when they say they're focusing on ps4/xbox I hope they mean they'll actually finish making it. Activision making terrible decisions as usual. The switch will be my console of choice for Japanese games then, since they actually took notice. After seeing Warframe, Skyrim, Zelda BotW, Doom, Wolfenstein 2 etc. etc. running on Switch I am pretty confident this game can run too. If 2 or 3 pixels are missing Digital Foundry may don't like it but I won't mind it at all. I’m pretty sure they’re awaiting a reduction in the price-per-unit on physical game cartridges. Of course it can run on Switch, it's just the game's file size, against the cost of cartridges, that's the problem. I would absolutely buy this on switch if it came out on the system. I'll definitely buy Crash right along with Spyro at that moment too if I can. Please bring the game over to switch! Why do devs not bother with testing other platforms? Especially the most popular one at the moment. It's just silly. This game is a blast on my Xbox One X. Although, I admit I should have bought it for my PS4. I cannot play this game on the Switch, with all the graphical concessions that must be made for it to run on it. A game this gorgeous must be played at the highest graphical fidelity that a console can offer. Switch Hardware is powerful enough. May cause heavy graphics and was lag. I really don’t understand why it wouldn’t? The ‘were not sure if Switch can handle our colourful but structured game’ responses get more and more silly the more games get released on Switch. If Switch can handle Odyssey, Fortnite, Paladins, Warframe, Breath of The Wild, Crash etc. it can handle Spyro. Please stop with the nonstop "Panic Button this, Panic Button that". On every article about some 3rd party game you read this nonsense. Panic Button won't, can't and shouldn't make the work for all other developers. @MrBlacky That's not an explanation and i haven't said it a million times. Your displeasure is out of place. Hopefully it gets announced in a Nintendo Direct, if Crash can run I don't see why this can't. I have no clue which engine they're using for this. Mostly likely, it could run on Switch. Might be a hassle though. And since you're asking, no, I'm not the target audience for this. Seems poorly optimized on other platforms. The work to port it might not be worth it. But hey, a remake like this doesn't really have a shelf date, the longer it takes the more likely people are to double dip. Besides that switch was the best selling console over black Friday and cyber Monday and it wasn't even on sale as the ps4 and xbone was 200 bucks. I just 100%'d it yesterday night on Xbox One so I can say my piece. Pull up a stool: you know me. I said once the games have barely aged a day and this is still mostly true. Switch-skipping or not, I'm glad new generations will get to define their childhoods with Spyro and Crash just as we did back in the day. Does it make the Reignited Trilogy automatically perfect? Of course not. Year Of The Dragon in particular, having its remake outsourced because Spyro as a franchise just can't escape development-rushing, is, simply put, buggy as hell. Technical problems aside, however, everything that was great about the original titles is still here. Aside from this guy, of course. Any black humor in "remodernising" this NPC would bump up the game's rating several notches. ... anyway! Back to the topic at hand, the games. The gameplay? Not as tight as Crash's makeover compared to the original, but still tight. The presentation? Fantastic. Overall, with a few tweaks there's no way this gem (sorry) would not sell on Switch (especially with some serious debugging). The three games, much like Crash's own trilogy, can be set apart by the identity each one has, and much like Glen Fox said about the first Crash game, the first one here has a "purity" of its own: it's simply the most speedrunnable collectathon you'll ever come across, and if you know what you're doing there won't be any backtracking involved. The level design is great as well, with one of the most reviled levels in it being actually a Sonic level in three dimensions one year before Sonic Adventure ever saw the light of day. The second one took what the first one built from the ground up and made it even better with minigames and sidequests, but unfortunately at the same time it introduced a particular kind of backtracking which at times made it hard for completionists to keep track of what has been already collected and whatnot (especially the infamous Alchemist sidequest in the Fracture Hills level; if you're new to Spyro 2: Ripto's Rage, leave that sidequest aside and focus on getting to the next world, without coming back until you get the headbash move - you'll understand). The game's strong points definitely outnumber its flaws, but the aforementioned sense of "purity" is kind of lost there. Then comes the final game of the trilogy, which has been imbued with the original developers' own bittersweet awareness of it being, well, the final game. They knew what was up. Still, the third game took the same "let's go crazy with playable characters and vehicles" approach Crash Bandicoot 3 also had, but didn't quite go, er, overboard (sorry, again) with it and instead they created a solid game with juuuuust enough Spyro platforming in it. And this pretty much rounds up the Reignited package for ya. One thing I should mention is the soundtrack, which, much like N. Sane, has been buffed up to a "great, albeit not stellar" level (despite the blessing of the original composer, apparently); however, unlike N. Sane, there's the option to switch (hint, hint, Activision, wink wink, nudge nudge) back and forth between versions of the soundtrack. Which means that, aside from the at-times-botched looping of the tracks (which played normally, ended on a fadeout, then restarted in the original games), her majesty Gnorc Cove is still here for young, virgin years to enjoy it in its full glory. It makes no sense not to have the Spyro Reignited Trilogy for the Switch. It makes me infuriated that in order to get the game, you either have to buy a PS4 or an Xbox One (something I can't really afford to buy atm) when I already have a Switch. Not sure it'll run? FREAKING SKYRIM IS ON THE SWITCH!!!! Do you know how BIG of a game Skyrim is compared to SPYRO!? You CAN go for YEARS playing Skyrim and not even be remotely close to being done with the game. If Skyrim can work for the Switch, then an easy game like Spyro Reignited Trilogy can work!!! You have no idea how much I'm hoping for them to port the Trilogy to Switch. Matter of fact, this is what I wanted them to do before we found out it was Warframe to receive the PB treatment. I didn't say that you said it a million times. And I explained it right well, why saying this on every occasion is unnecessary and dumb. Unless of course, you want to support the laziness of other developers and wait for a possible Switch version a few years. Can we not have any article about a third party game without drones mindlessly going ‘Panic Button, Panic Buttonnnnnnnn’? If they can’t get a remake of a PS1 game to run, it’s not very well optimised. It’ll be out next year. Personally I’m not interested unless it does. Pushing the panic button (haha) to relieve your fears every time a game you want doesn’t come to Switch is silly. There is no all in one console that will fulfill all your gaming dreams. Don’t get me wrong I would like it on Switch too, but it’s just not the case. @Pod Spyro runs on Unreal Engine 4. So it should work on Switch. I've got it on PS4 and the frame pacing is quite stuttery though, so not sure if it could potentially be a lot worse on Switch. Honestly sounds like amateur Developers who don't know how to optimize their code to me. The Nintendo switch may have a cartridge capacity limit but in reality there are so many compression methods and so many coding changes that can be done to reduce that file size to fit within the limit. If anyone wants to disagree with me they should watch the TED Talk with the guy who invented Linux. He complains about how programmers take lazy approaches and have dirty code that takes up 17 lines when it could have been done in three or four. And when you do this several hundred times that's a bloated game that could have been optimized to perform better and need less processing instructions. If Mario Odyssey exists, can anyone explain why Spyro can't run? I know that's a massive simplification from one point of view. But from another it's true. If Nintendo can produce a game that looks as good as Odyssey, then to that more-than-adequate level of detail why cant other developers achieve the same. I'm sure Nintendo could help them with optimisation advice for the Switch in particular. I and many others are not bothered about 1080p and 60fps in all games - and with that in mind I can't see that the Switch is as limited as the industry seems to make out. I mean look what Nintendo achieved with the Wii U in MK8 and SM3DW. It all just seems like BS. This shows that rumours and website listings aren't always true. No Switch version has been considered. Its kinda baffling really why they have not even bothered to test the game on Switch. The game uses UE4 even which Switch supports naturally. @MeatSauce 63 gigs if I remember correctly. It was a HUGE download. They really need to figure out how to compress language files. Seriously!? With all the technical marvels on the Switch and THIS is the port that breaks the system? Sounds like a lazy response. I'll never understand how some of these publishers operate. How can Activision, the company behind Skylanders, which was treated as a Spyro spinoff, seemingly be entirely unaware of the interest in their product from the Nintendo market? These are PS1 games....how bad does your engine have to be to not be viable on Switch out of the box? I'm increasingly convinced that large games publishers executive management are in fact financial analysts and fund managers who know only how to operate by adding the lines at the bottom of spreadsheets without any understanding of the actual market that generated those numbers. That kind of management in the retail space brings us gems like Sears and JCP. The numbers are useless if you don't understand the market that drives them. Honestly, Crash got ported over because a lone developer spent their weekend porting and testing the first level with great success, and that game had its own special engine that had to be ported too. Spyro runs on UE4, which is fully supported on Switch and continues getting visual and performance improvements over time. While having UE4 on Switch doesn't guarantee the port, it certainly cuts out a lot of the work to get a version of the game up and running. If it arrives on Switch, I'll buy it...otherwise I'm not interested. This kind of a game would have been perfect on the system. And as @Discostew said above, this game was done in UE4 so really there's nothing standing in the way except Activision's laziness. I would love to see the Spyro Trilogy on the Switch. A barebones port would probably run terribly on Switch then, if at all. Could crash for various reasons due to the difference in CPU architecture. Though once it runs, everything should pretty much look the same, since the GPU is NVDIA, and the games doesn't look heavy on custom solutions at all. Maybe I should just play the originals on my PS Vita instead. Want to buy a PS4 but can't justify enough games I want for it to make it worth the cost. If the Switch can run Doom it can run Spyro. @brunojenso Plus if nintendo works hard on future games, we could see games look even better than Odyssey. @NotTelevision But still there are so many other games that look better than Spyro so why does this game be the switch breaker? Spryo is on UE4 which supports switch as-well as Epic games making improvements to the engine to use more of switches power. Have it’s my lack of nostalgic feelings for it but I don’t get the appeal of Spyro. Got it on Xbox One, having never played the originals back in the day. I don’t get it. My kids love it, but they’re six so they’d play Hello Kitty Karts if you put it in front of them. @Pod It's running on UE4. doesnt the switch natively support unreal engine 4? it might take some tweaking of the graphics, and i know its not as simple as plug and play, but i see no reason why it shouldn't make its way to switch. given crash bandicoot made its way over and seemed to sell well enough, youde think theyde have begun porting by now. if activision is too lazy to figure out, maybe they could hand it off to the guys who did the doom port? might as well give the business to a REAL studio. i know theyll basically only get paid for their time and not the sales, but still. Aye, Perryg92 beat you to the punch, but thanks anyway. @gangsterswedish never played it before just bought it on xbox and love it. it is a collectathon and I am a big 3d platforming fan. i agree on the face of it it shouldn't be enjoyable but i think what makes it work is the level design, rather than run around aimlessly it is pretty clear where to go and the gems act really well in that sense. i just feel like good game design doesn't age, so once graphics are updated this plays like an n64 era game. insomniac are quality game developers and this proves it for me, not surprised everything they have done since has pretty much been a hit. No big loss for me, grabbed it on PS4...pretty dull game. If it does come to Switch then it needs a lot of retooling to bring the size down. Switch owners wont put uo with huge additional downloads. It's not a matter of it could be ported. That's not even a question anymore. Doom, Crash, LA Noire, Dragon Ball Fighters, Civilization 6, Skyrim, Warframe, Paladins and other high demand games have been ported successfully to the Switch. It's not a question of if it CAN be ported successfully. It's a question of, are they WILLING to put the effort into it. I would 100% bet it is coming to the Switch, They won't admit to it being worked on at the moment as they would sooner people double dip by buying the Xbox/PS4 version and then buying the Switch version when it gets surprise announced. I can see them releasing each game separately to help with the overall size of the game(s). You must be a very untalented developer if you can´t get this running smooth on Switch when you look at games like Warframe, Wolfenstein or Doom being able to run on the Nintendo console. At all, I am not interested in the series. Looks dull and too easy to play. "I don't know if we can do it. We would have to turn down the resolution, compress some data, and scale back effects. That would be awful! Don't you guys own a PS4?" Activision probably wanted to see how well it would sell on PS4 and (more importantly) Xbox before deciding whether to port a more scalable PC version. If they do a PC version, the Switch would follow if they choose to scale down far enough. When you're selling nostalgia, it makes sense to sell to the playstation crowd first. The original wasn't released elsewhere, to my knowledge. The Xbox has similar specs in a locked architecture, so if you are going to get this game out as fast as possible to capitalize on the sudden success of remastered titles, those platforms are the obvious choice. It's possible success on the xbox marketplace will decide whether or not to port further as well, since Microsoft's crowd doesn't have the nostalgia advantage. @CarsonCool Absolutely - it used to be that you'd see a huge difference in the fidelity of the graphics at the beginning of a consoles lifespan to the vast steps forward towards the end - as developers (both first and third party) 'mastered' the hardware. Unfortunately I do think we are spoilt by tech now and devs would just rather wait for more powerful hardware to turn up than to push the boundaries of the current system and improve their skillset. It is situation-dependent laziness that means we may never see the full capabilities of the Switch. Except hopefully from Nintendo themselves. I don't see why it wouldn't come to the Switch. After all, every "Spyro" game (or variant thereof) since "Season of Ice" has been on a Nintendo platform. Even though I have it for the PS4, I would get it for the Switch again, in the same way that I bought "Skyrim" for the third time (first for Xbox 360 and then Steam) and "Undertale" (shared with me by my cousin on Steam) for the Switch. I would love to take the experience on the go. 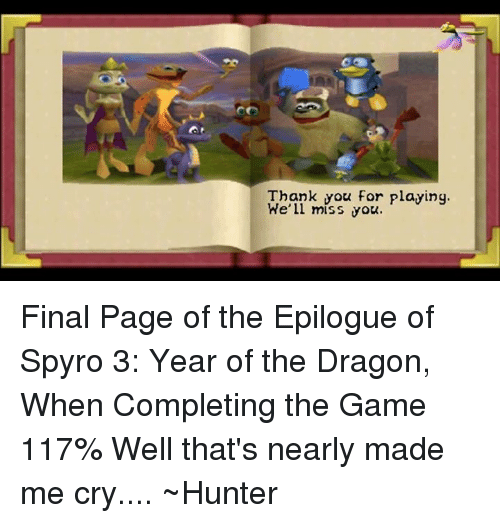 Not only that, but I hope "The Spyro Reignited Trilogy" reignites (pun absolutely intended) interest in the series, so that we get a sequel to "Shadow Legacy" (the final game in the original continuity, and oddly enough, exclusive to the DS), where it left off before being rebooted with "The Legend of Spyro" trilogy. It will happen, of course. I really really want this to happen! I really hope it comes to switch, as i dont have a ps4 (although i do plan on having one by at least late 2020) or xbox one it would be a joy to finally have this game AND to have it on the go. Even if you have the game on ps4 and/or xbox one imagine having Spyro on the go!